In 1991, toy maker Kenner was acquired by fellow toy company Hasbro, best known today for their Transformers, My Little Pony, and Jem and the Holograms Toys. 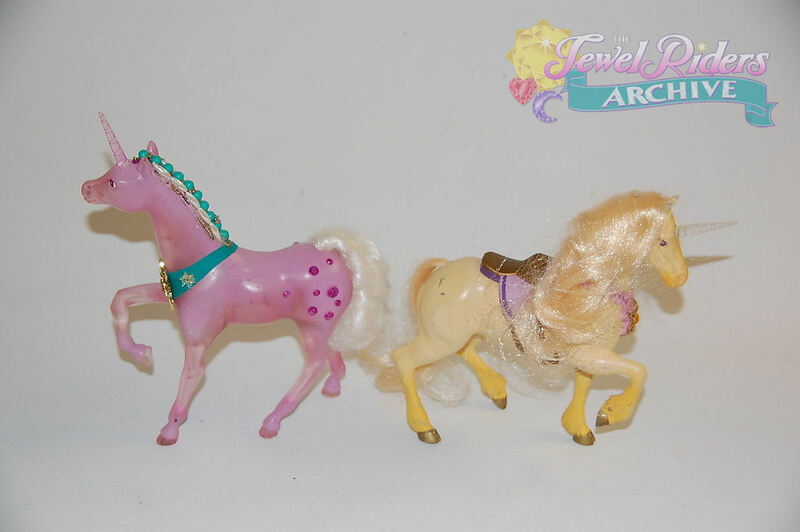 And in 1994-1995, Kenner-Hasbro was hard at work on a new line of magical action dolls under the working title “Enchanted Camelot.” Other aliases included “Enchated Jewel Riders” and “Princess Guinevere and her Jewel Adventures.” Whether the toys came first, or the story ideas by Robert Mandell is unknown. 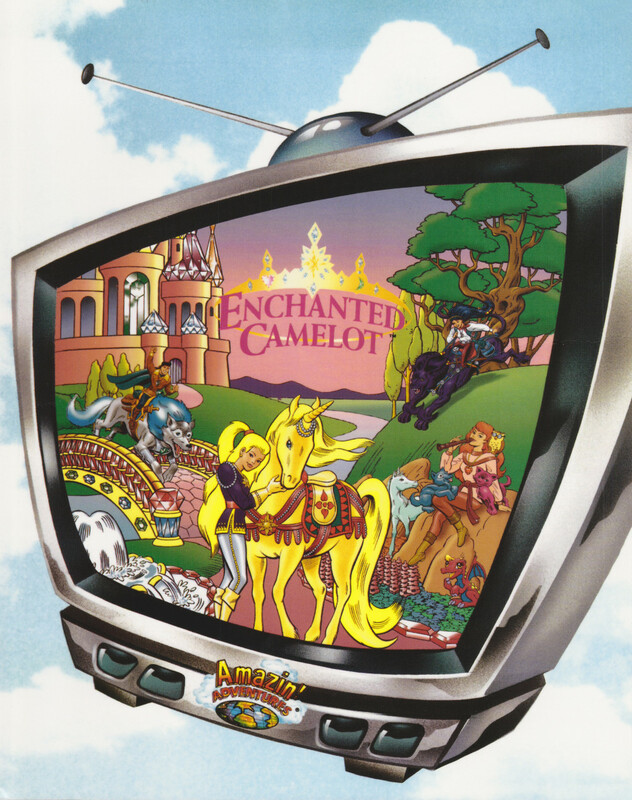 But “Enchanted Camelot” was the first stage of Jewel Riders’ evolution to the show we know and love today. In this version of the story, Princess Guinevere, Melody (Tamara), Alexandra (Fallon), and Shawn (Drake) ride the Wild Magic with their friends Amber (Sunstar), Cleo, Samantha (Sugar), Rusty (Spike), Moonglow (Moondance), and Thunder. You can, of course, read the Enchanted Camelot script for the episode that became Jewel Quest here on the site. 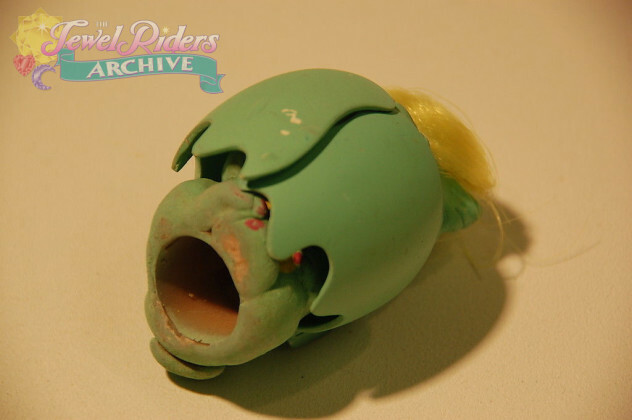 Over the last several years, pre-production toy concepts have gone up for auction on Ebay, and several have sold for hundreds of dollars. 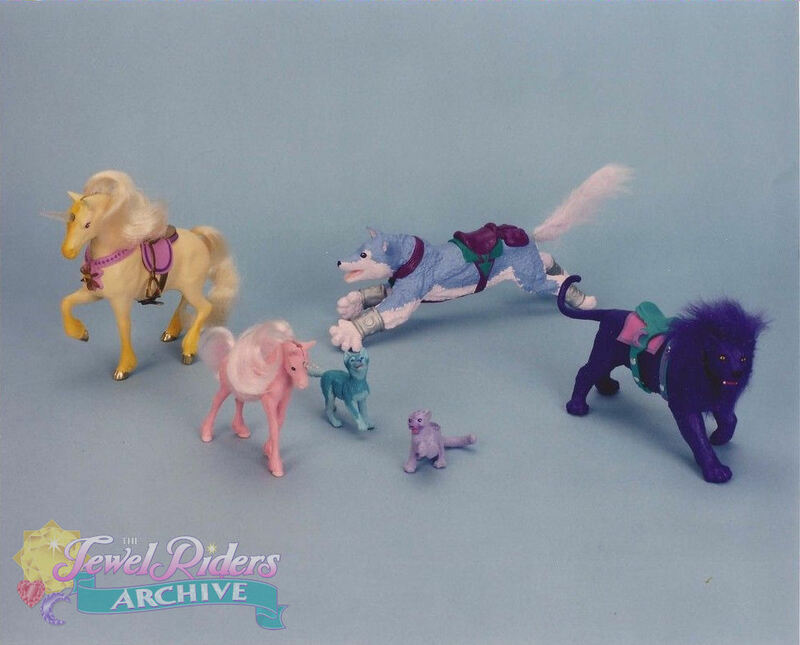 [The above] image shows the original set of animals that were part of the first concept testing from “Enchanted Camelot” which became the “Princess Gwenevere and Jewel Riders” animated tv series. …So where are the wings? you are probably asking? Originally Sun Star did not have wings and was just a unicorn. 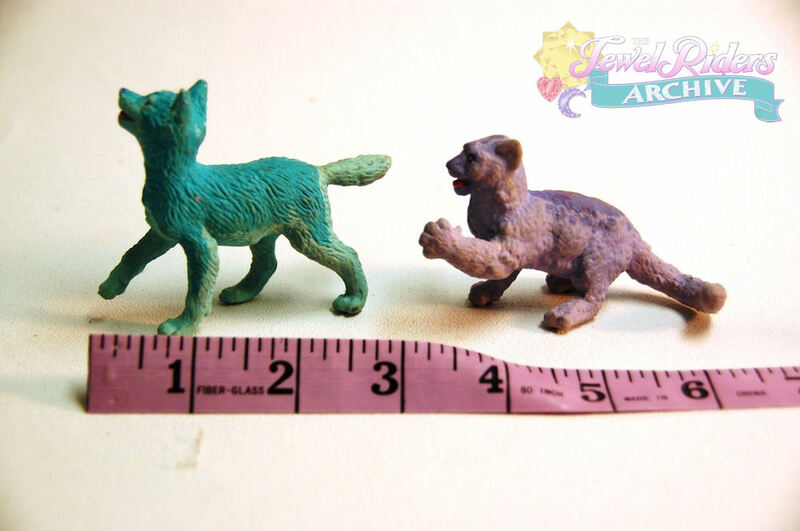 Various models are made at different times of the project. The yellow model was the very first concept model when it was tested with children. It was made from an existing horse and modified. The horn used to light up but batteries have probably corroded the system. 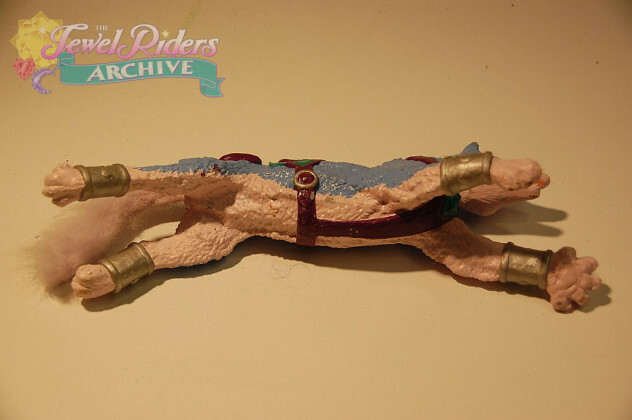 The pink model was the first color test seeing if it would look good as a clear horse with opaque paint. It was eventually decided that giving Fallon a horse was not magical enough so Fallon’s horse became a unicorn and Gwen’s horse became a flying unicorn. One of the images shows the original set of animals that were part of the first concept testing from “Enchanted Camelot” which became the “Princess Gwenevere and Jewel Riders” animated tv series. 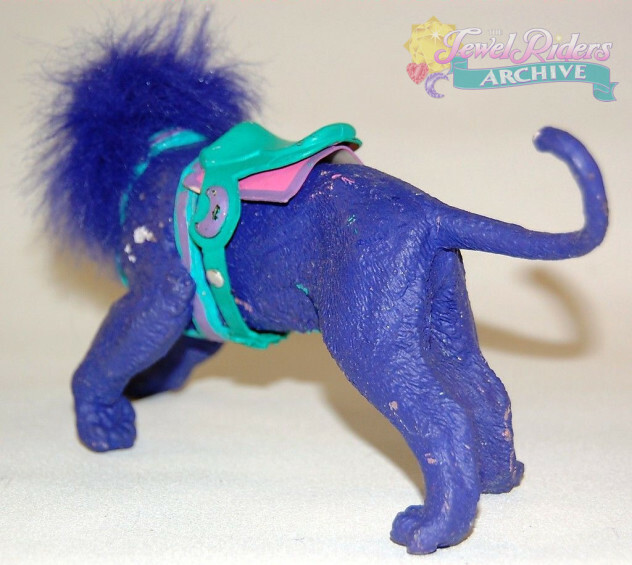 …So, about now you are thinking “What Lion?” Fallon rides a blue unicorn!” Well, orginally she did not. 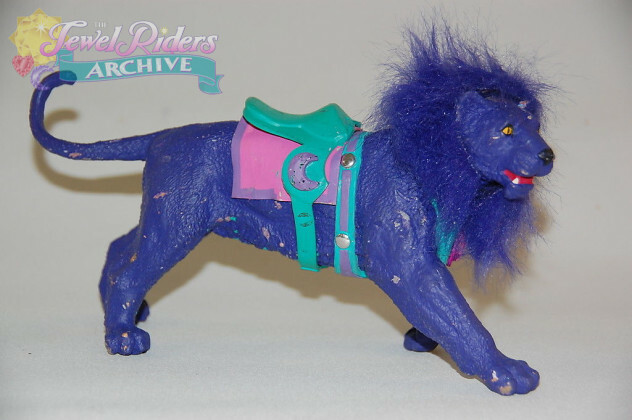 Each of the characters had a different animal to ride. 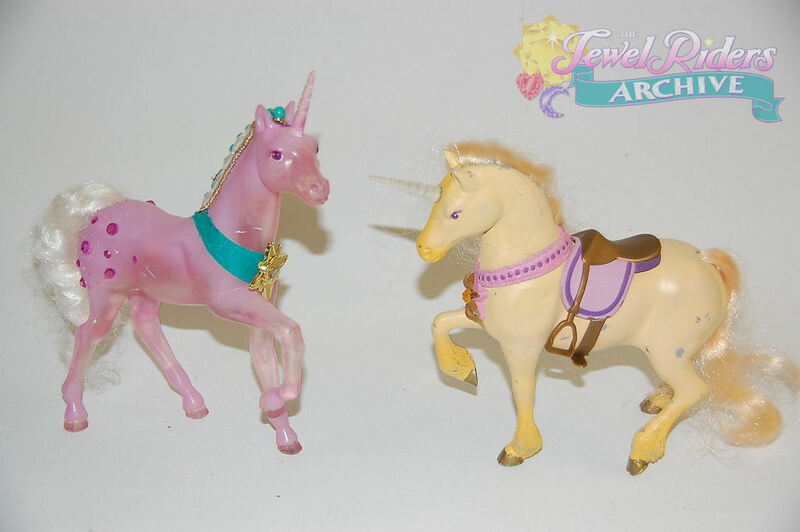 But after early concept testing it was decided to go with the unicorn for the girls and make Gwen’s unicorn into a pegasus since girls like horses more. 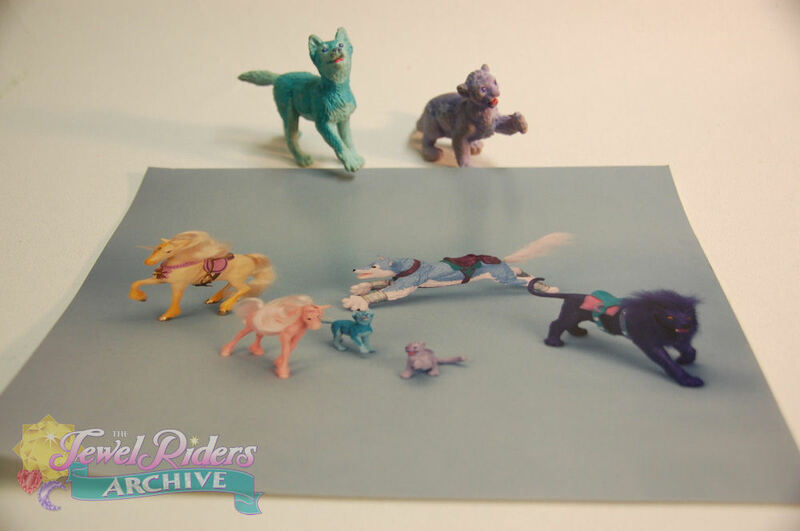 One of the images shows the original set of animals that were part of the first conept testing from “Enchanted Camelot” which became the “Princess Gwenevere and Jewel Riders” animated tv series. This model is what is called “kit bash”. 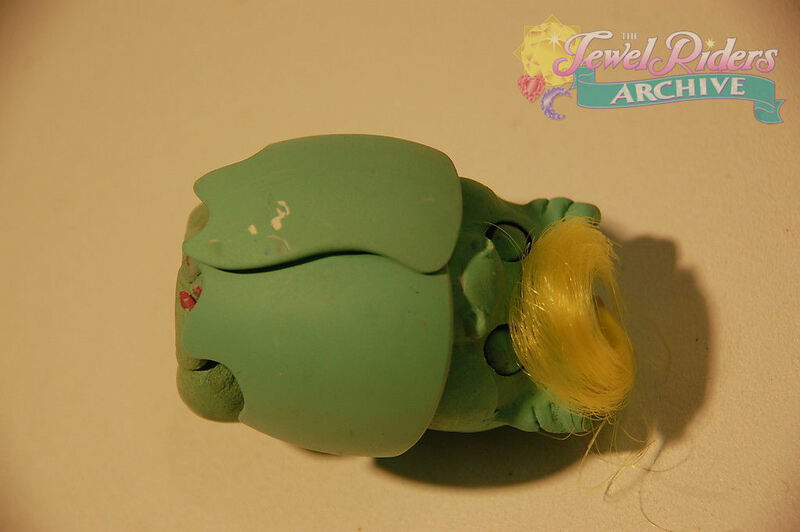 It is a rough model usually formed from other existing peices to test the concept. 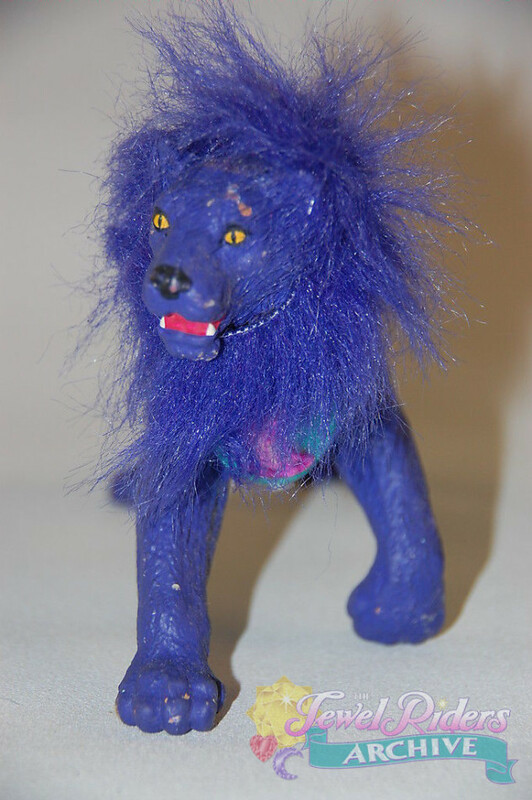 This is a purple lion in keeping with Fallon’s color scheme in the show. 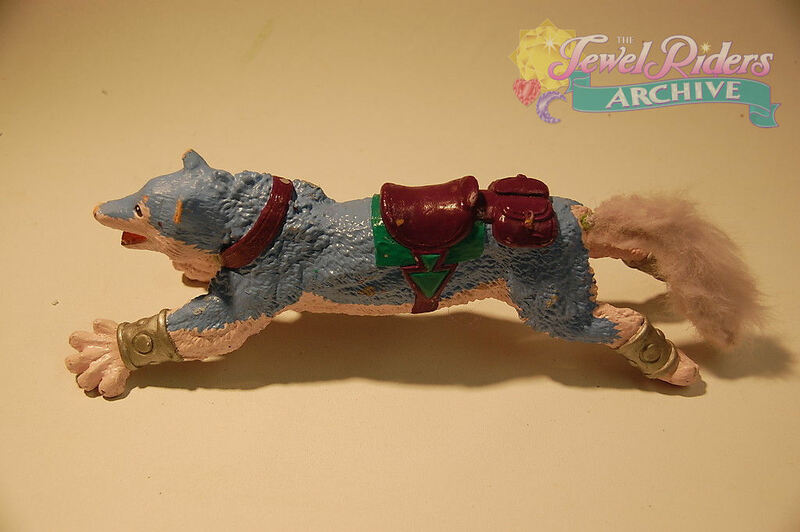 It also has her moonstone shapes on the riding gear. Note that not all of the models in the group shot still exist. 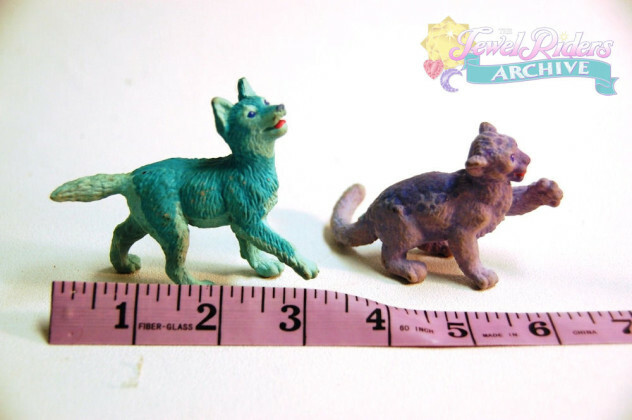 The ones that do will show up in a later auction. This auction is only for the lion. Moonglow? Fallon’s steed appears to have bounced back and forth between cat and horse. 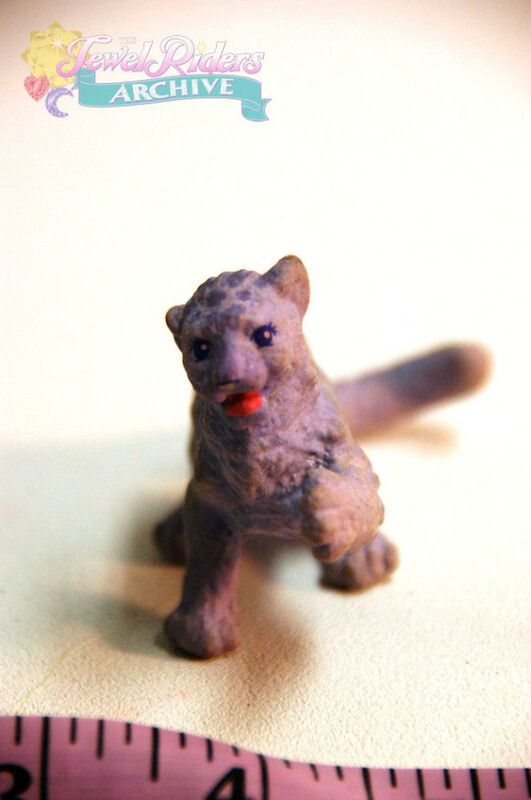 Various models are made at different times of the project. 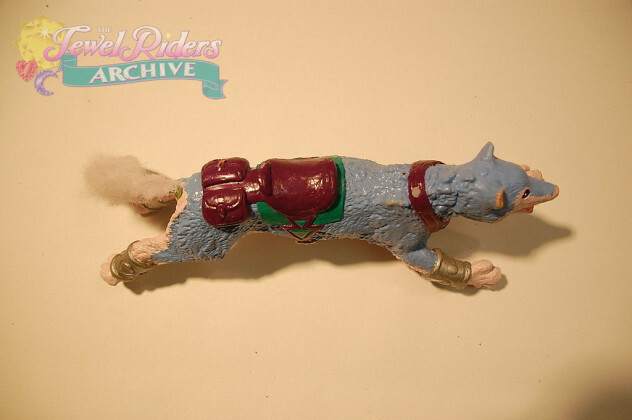 The wolf that Drake rides was one of the very first concept model when it was tested with children. 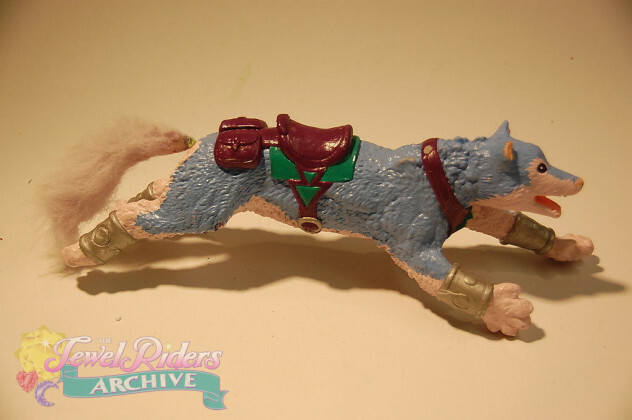 It was made from an existing toy and modified with wax, Sculpy and fur. The head is an original wax sculpting and the ear tips have broken off. The character did not change much from this original look – but this never made it into production. 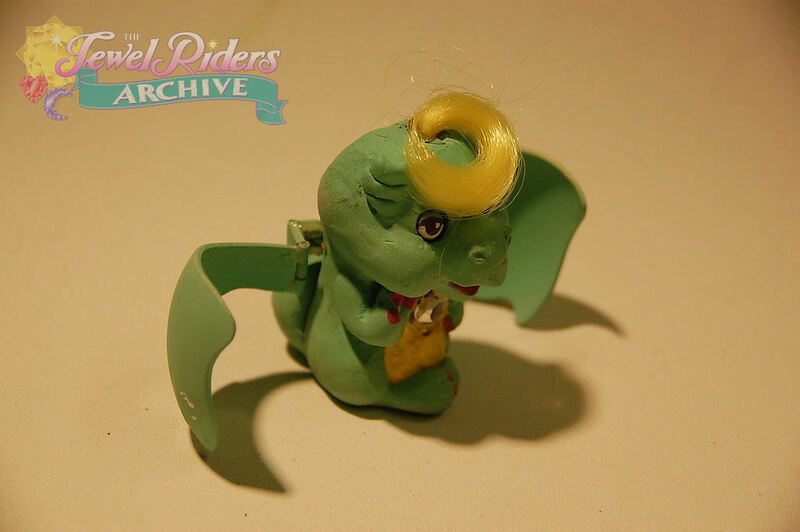 One of the images shows the original set of animals that were part of the first concept testing from “Enchanted Camelot” which became the “Princess Gwenevere and Jewel Riders” animated tv series. The Wolf is one of those animals. 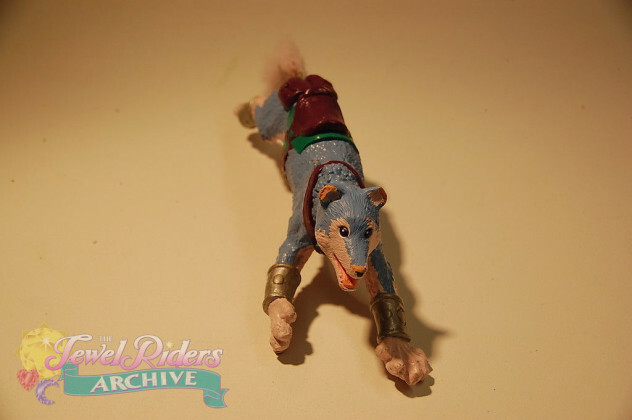 Shawn (Drake)’s wolf Thunder. Sadly, one of these was never actually produced in the line that made it to retail! 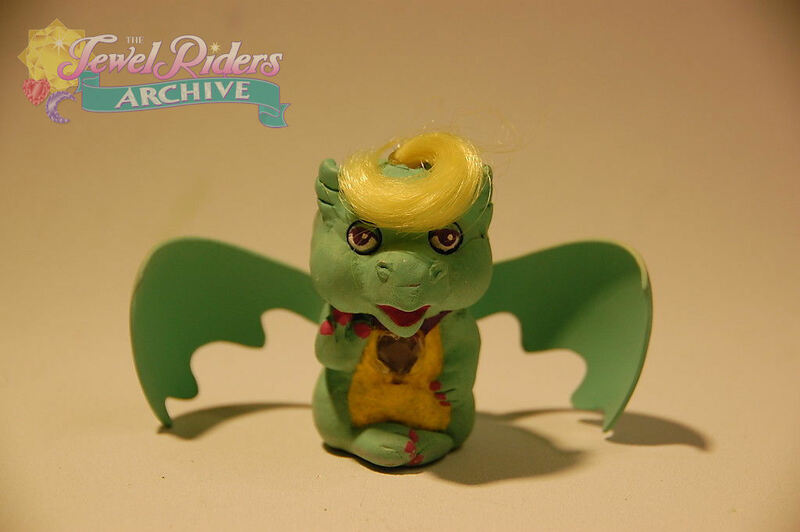 This is a model of the small green dragon which always accompanied Tamara on her adventures. 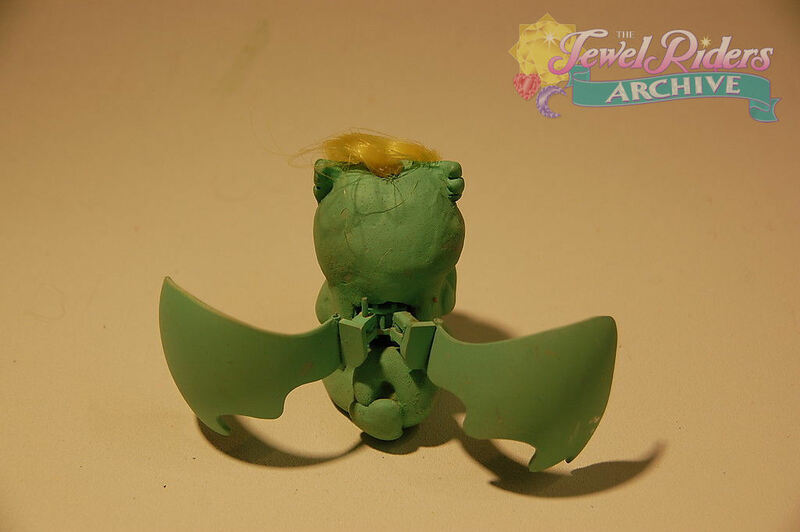 It is a concept model showing how the character and its feature would work. The play pattern on this is to play with wings that open for day adventures, then lay it on its back so its eyes would close and the wings wrap around it to pretend to sleep. There was a feature in its necklace jewel that when bright and dark with gravity – but it does not seem to be working any more. Samantha (Sugar). We would have loved to see one or more of Tamara’s Babies other than Spike make it into the line! 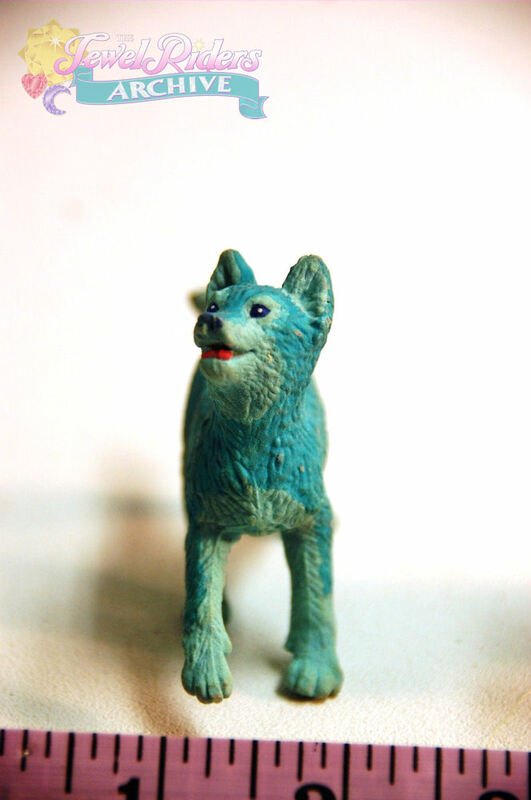 These types of models are created very quickly and rough. These two figures were existing product on the market that were repainted to look close to how the final product would eventually look. And that’s it, folks! Enchanted Camelot would have been so, so different, and yet there are so many hints that it was growing into the series we know and love. We hope you’ve enjoyed this retrospective on Kenner and the “Enchanted Camelot” toys!